The St. Joseph Church Choir gave a presentation about their visit to Pfaffenweiler in 2005 to the Deutscher Verein Membership on March 16 during the monthly Deutscher Verein Meeting. The search for an intern accounting position for Patricia Keller from Pfaffenweiler in Jasper has been unsuccessful early in the year. Annual Board of Directors Meeting was held Wednesday, March 29, at the Schnitzelbank Restaurant. Annual Membership Meeting took place during the monthly Deutscher Verein Meeting April 20, at the French Lick Winery. Danny Wehr gave report and all Directors and Members of the Board were elected as nominated by the Board. Sister Cities International celebrated its 50th anniversary in July of 2006. During the celebrations many volunteers making this organization such a huge success over the past 50 years were honored by being recognized verbally and in the anniversary publication. Sister Cities of Jasper nominated past City Council at Large Vic Knies and Buergermeister Fritz Gutgsell to the Local Government Leadership Circle. (two nominations permitted per organization). Dave Buehler, Martina Eckert, Matthias Hilger, Mary Jo Meuser, Ruth Reichmann and Dan Wehr, were nominated to the Circle of Distinguished Volunteers. (six nominations were permitted per organization). 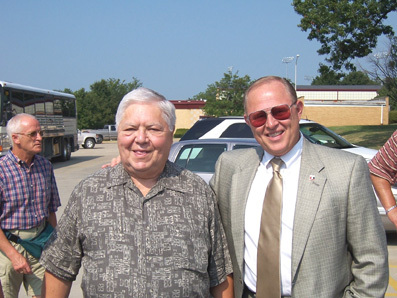 Senator Richard Lugar mentioned Jasper in his speech and press releases in connection with the Sister Cities International meeting in July of 2006. Father John Boeglin and Dave and Janet Kluemper visited Pfaffenweiler during their Schneckenfest early September. Al Schuler and Dr. Tom Eversman from Jasper visited friends and relatives in Switzerland and also stopped in Pfaffenweiler. Tom Kiefer from Jasper visited Pfaffenweiler late in September to attend a birthday party for his relative Gustav Kiefer. The same weekend the elections for the new Buergermeister took place and Tom was the first one from Jasper to congratulate Dieter Hahn on his election win. The Exchange students from the Faust Gymnasium Staufen arrived in Jasper on September 26 including three students from Pfaffenweiler. They stayed three weeks. Dieter Amann from Pfaffenweiler visits friends in Jasper. Bob Grewe, President of the Dubois County Area Development Corporation visits Pfaffenweiler on November 14 and 15. On November 20, Mayor Bill Schmitt called Buergermeister Fritz Gutgsell on his last day in office. On November 21, Mayor Bill Schmitt called the new Buergermeister Dieter Hahn to welcome him in his new position. Future visions were discussed. The Herald discontinued sending the combined weekly editions to Pfaffenweiler in September. The City of Jasper has taken on this responsibility. This has been going on now for 10 years. Werner Kiefer from Pfaffenweiler visits his relatives in Jasper in early December. Pfaffenweiler's e-mail version of the Gemeindeblatt (weekly newspaper) continues to be successfully sent to Jasper and friends around the world every week. The "Pfaffenweiler Column" contributed bi-weekly by Franz and Matthias Hilger continues to have a huge following in The Herald. This column has been published for 10 years. The annual fundraiser for the JHS Student Exchange program by Sister Cities of Jasper has been initiated in November and is on target to be successful again. Included in the funds received is a Grant from the Dubois County Community Foundation which increased to $1,000.